Today's the day!! My parents arrive in Germany this evening! They'll be spending the next week jaunting around our host country taking in all the wonders of the glorious Christmas Market season. First stop on our list...Strasbourg, France! I realize that's not Germany, but mom my has been dying to see France, so Saturday we'll be eating French macarons and strolling Petite-France so she can get her fill. Strasbourg also has a pretty stellar Christmas market, so they'll likely be lots of glühwein drinking, too! While I'm off showing my parents the best of Europe at Christmas time, won't you visit the two sweet bloggers below and link-up your blog to the Fresh Face Friday Blog Hop? I'm positive you'll have fun! I've known Allie and followed along with her blog, Between Dreams, for quite a while now. She's absolutely one of the most uplifting, inspirational, sweetheart's of blogging out there! Every post that comes from this girl is chock full of positivity, fresh ideas, and tips for making your life just that much better. I also love her newly adopted Love List series featuring fun bloggers, cool internet musings, and things about her life that she's grateful for. Always such a joy to read! If you've never met Allie or read her blog, what are you waiting for? Let her light touch your heart! 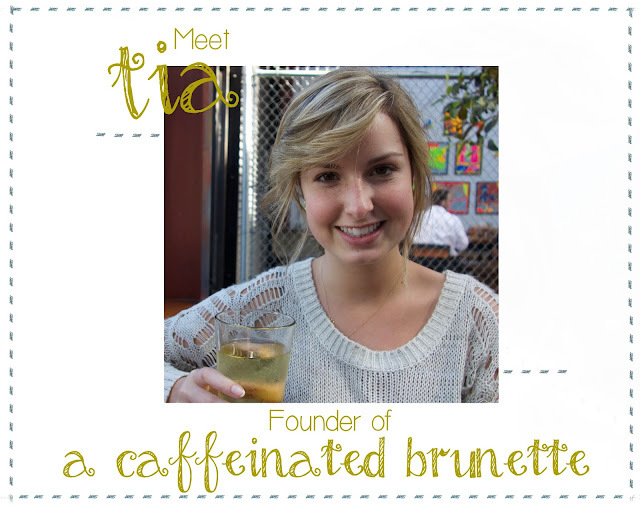 Meet Tia, a native New Englander turned California girl now living in the Big Apple! Whew! :) Over on her blog, A Caffeinated Brunette, you'll find fun posts showcasing some of Cali's best sights & restaurants, some seriously delish recipes (I want to try these Rocky Road Bars! ), and lots of musings from one caffeine obsessed brunette. You should also check out her 'If You Ever...' series, I'm loving Tia's clever topics! Head on over and get to know more about Tia today, friends! I hope your parents will enjoy Germany (and France)! I hope you enjoy the Christmas Market in Strasbourg- my parents are heading there too this weekend. You asked about some Christmas Markets: I went to the one in Frankfurt which isn't to far from Wiesbaden and was really pretty but unfortunately crowded. I think I enjoy the smaller town Christmas Markets more because there are not that many people and the atmosphere is much nicer. I hope you have the best time with your family! It doesn't get better than Xmas time in Europe!! !